This is so silly, but the kids got a kick out of this watermelon turtle. I have to say that the adults got a good laugh as well! We had half of a watermelon and I asked the boys if they could think of anything fun to do with it. It seems like I have seen everything under the sun made out of watermelon so we wanted something different. Their uncle Brian was in the room and said…make it into a turned over turtle. I’m sure he was not thinking that we would actually do it, but we sure did! We cut the bottom off of the watermelon to make sure it did not roll around. Use the part that is cut off to make the tail. We used 2 green apples. Take one apple and put a tooth pick in the bottom and stick it on the edge of the watermelon for the head. We used a scrap piece of the cut off watermelon for a little support under the apple. Cut four sides off of the other apple. Shape those into feet and pop them in the sides with a toothpick. We used 1 mini marshmallow cut in half for the eyes and 2 mini chocolate chips. We made the mouth with chocolate cookie frosting. You just can’t get any easier than this! « Previous PostRing Ring…It’s a Phone Fruit Snack! Next Post » Ice Cream S’mores Pops! Hilarious! I'm going to try making this! LOL!!! 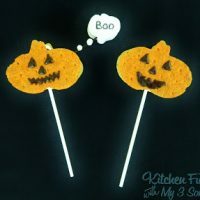 This cracks me up–what a cute idea! 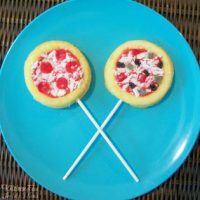 Thanks for linking up on the "Flash-back-Friday" hop, I would love for you to stop by and link up again! So funny!! My kids would love this!! funny with a side of tasty. I LOVE IT!!! I was completely fascinated by the shark watermelon that a lot of people have done, but it looks so time cosuming. This, on the other hand, looks super adorable and pretty easy to do. Very cute! I am posted just below you on Tatertots & Jello so I thought I would come see your blog. Great ideas! Thanks for linking to Bacon Time hope you will always come to my party. I love this! So cute. I have half a watermelon sitting in my fridge as I type. I now what I'm doing with it now!! :o) Thanks for sharing. That is so fun! And even better because I think I could actually pull this watermelon sculpture off! OMG I think I just found a new favorite blog!! 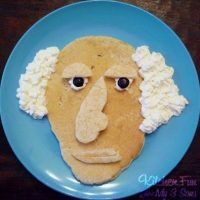 My kids are gonna LOVE making these! This is the cutest! I love it! I am your newest follower. I would love it if you stopped by and became my newest follower! Have a great day! What a clever and cute idea. I got a kick out of it, and will be trying it for our next summer gathering 🙂 Thanks for sharing. I'm so gonna try this! You have great ideas! This is hilarious!! I love it! This is sooo cute! 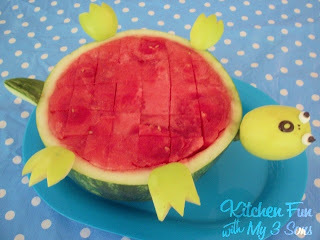 I did a how to cut a watermelon tutorial on my blog earlier in the summer, but I love this! that's cute, i love this sort of stuff. would be great for our annual luau! This is just adorable, I love it! Thank you so much for sharing this great recipe with Full Plate Thursday and please come back soon!